On bottom of overturned barrel, first three letters in ligature: "JADuck"
Framed by an arched doorway, two soldiers sit smoking, drinking, and chatting with a young woman who sits casually on tiled steps. Behind the woman, a warm light enters to permeate the setting and the objects and figures within. To the right, another woman descends a dark staircase and prepares to enter the room. In the foreground a jumble of objects--rifles, armor, a drum, a pipe, an overturned pail, and yellow drapery--form a more complicated still life grouping. On the back wall, a wooden rack holds pewter plates, crockery, and spoons. 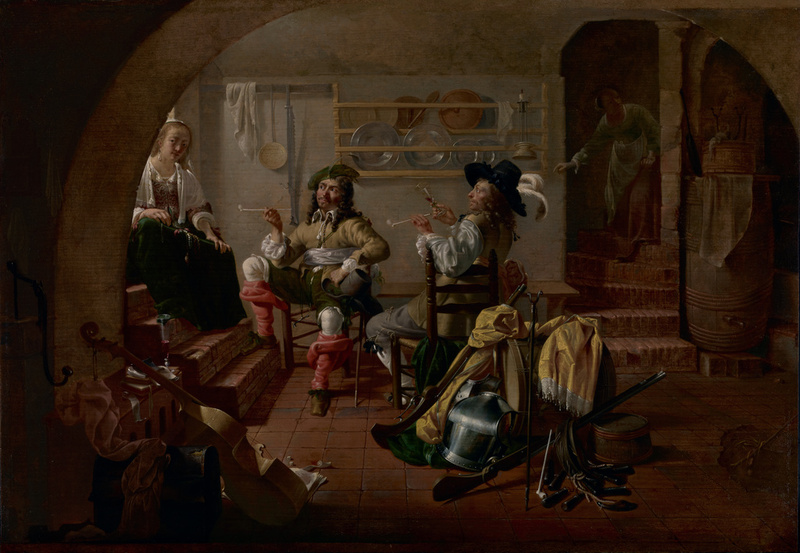 This genre scene, an unidealized view of everyday life, illustrates Jacob Duck's shrewd observation of costumes, setting, and objects, as well as his ability to render the surfaces of metal, stone, cloth, and wood. Source: Paillet, Paris. Catalogue des tableaux précieux, February 18, 1793, manuscript annotation. Adolphe Schloss, 1842 - 1910 (Paris, France), by inheritance to his wife, Lucie Schloss, 1911. In the possession of the Vichy government of France (Chambon, France; Paris, France), sequestered by the French State Museums at the Musée du Louvre, 1943. Musée du Louvre (Paris, France), restituted to the Adolphe Schloss Family, July 1946. Rosenberg & Stiebel, Inc. (New York, New York), sold to J. Paul Getty, 1951. Paillet, Paris. Catalogue des tableaux précieux des écoles d'Italie, de Flandres, de Hollande et de France[...] le tout provenant du cabinet de feu M. Choiseul-Praslin. February 18, 1793, p. 60, lot 114. Wurzback, Alfred von. "Duck, Jacob." In Niederländisches Künstler Lexikon. Vol. 1 (Vienna: Halm und Goldmann, 1906), p. 434. Lilienfeld, Karl. "Jacob Duck." In Allgemeines Lexikon der bildenden Künstler von der Antike bis zur Gegenwart. Ulrich Thieme and Felix Becker, eds. 37 vols. (Leipzig: Seeman, 1907-50), vol. 10 (1914), p. 40. World Collectors Annuary. 47 vols. (1946-97). (Amsterdam: Minerva Uitgevers Maatschappij, 1951), vol. 3, p. 190, no. 1139, ill.
Galerie Charpentier, Paris. Collection de feu M. Adolphe Schloss (deuxième vente): Tableaux anciens. December 5, 1951, unpaginated, lot 18, pl. 13. Valentiner, William R., and Paul Wescher. The J. Paul Getty Museum Guidebook (Los Angeles: J. Paul Getty Museum, 1954), p. 26. Fredericksen, Burton B. A Handbook of the Paintings in the J. Paul Getty Museum (Malibu: J. Paul Getty Museum, 1965), p. 17, no. G-87, pl. 14. Getty, J. Paul. The Joys of Collecting (New York: Hawthorn Books, Inc., 1965), pp. 30, 115, ill.
Fredericksen, Burton B. Catalogue of the Paintings in the J. Paul Getty Museum (Malibu: J. Paul Getty Museum, 1972), pp. 90-91, no. 120, ill.
Baroque Masters from the J. Paul Getty Museum, exh. cat. (Northridge: California State University, 1973), p. 9, no. 13. Fredericksen, Burton B., ed. The J. Paul Getty Museum: Greek and Roman Antiquities, Western European Paintings, French Decorative Arts of the Eighteenth Century (Malibu: J. Paul Getty Museum, 1975), p. 120, ill.
Sellin, Paul R., and Augustus J. Veenendaal, Jr. "A 'Pub Crawl' Through Old The Hague: Shady Light on Life and Art Among English Friends of John Donne in the Netherlands, 1627-1635." John Donne Journal 6, no. 2 (1987), pp. 246, 254n44, 257, fig. 2. Jaffé, David. Summary Catalogue of European Paintings in the J. Paul Getty Museum (Los Angeles: J. Paul Getty Museum, 1997), p. 36, ill.
Salomon, Nanette.Jacob Duck and the Gentrification of Dutch Genre Painting (Doornspijk, Netherlands: Davaco, 1998), pp. 134, 144, no. 13, fig. 131. Giltaij, Jeroen, et al. Senses and Sins: Dutch Painters of Daily Life in the Seventeenth Century, exh. cat. (Rotterdam: Museum Boijmans van Beuningen, with Hatje Cantz, 2004), p. 94, under no. 17, fig. 1, entry by Jeroen Giltaij. Rabb, Theodore K. The Artist and the Warrior: Military History through the Eyes of the Masters (New Haven and London: Yale University Press, 2011), pp. 115-16, fig. 49.